What can we say about All-Clad that hasn’t already been said? As one of the world’s most well-respected producers of metal cookware, they’re a brand you can really rely on. Since 1967, the US company has been producing pots and pans like no one else – handcrafted by American artisans using American steel. If you don’t believe in compromising on quality when it comes to kitchenware, then you can’t afford to miss out on All-Clad. The All-Clad Copper Core Dutch Oven features the high level of quality you’ve come to expect from this respected brand, making your cooking life that little bit easier. 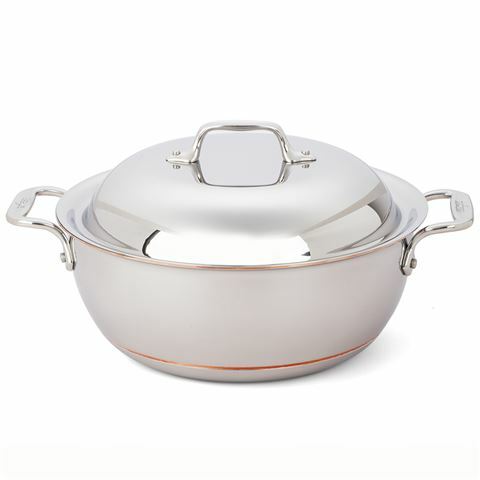 Formed from high quality stainless steel and copper – with a mirror polished finish – this dutch oven is perfect for braising, stewing, browning and slow cooking due to its generous size. It also features a non-stick base and is perfect for both hob and oven use. Making one pot meals has never been easier. Formed from stainless steel and copper. 5-ply construction with a copper centre. Copper centre allows for precise temperature cooking – perfect for sauces. Suitable for hob and oven use. Ideal for slow cooking and one pot meals.